I think I’ve died in Outward more so than any game I can remember playing. Well, maybe “dying” isn’t the correct term (that’s something we’ll touch on later); instead “failing” is a bit more accurate. Either way, Outward, from Nine Dots Studio, is a game that will chew you up and spit you out. But isn’t that what we want out of an adventure sometimes? 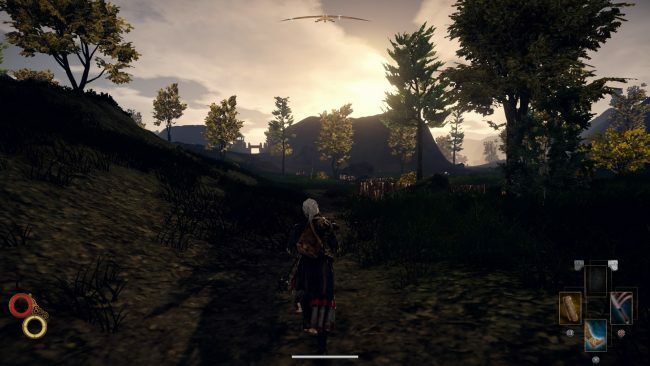 Outward immediately makes its intentions clear by casting you not as some grand hero in a world-saving plot, but rather an everyman simply living in a fantasy world. You’re not some kind of chosen one, or destined to fight a Great Evil. Your whole journey starts simply because you’re trapped in a generations-long debt. You won’t be glamorized in this adventure; you just need to do what it takes to survive. This is a game that hearkens back to an earlier era in video games, for better or worse. Yes, on a very surface level, it’s visuals are dated, and that may turn some people off. But go past that, and you’ll find yourself in a compelling, albeit unforgiving world. 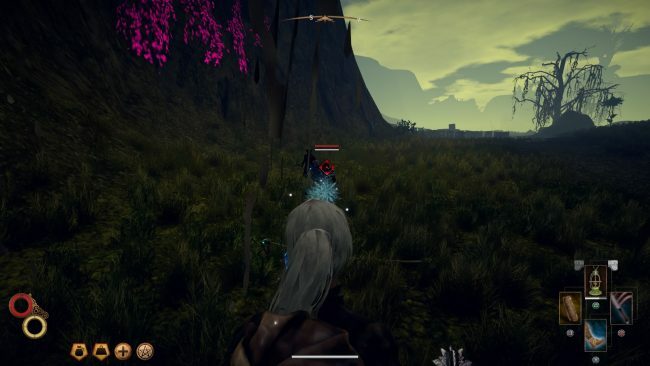 Outward makes some very specific twists on the standard RPG formula, twists that give it some pretty hefty bite. 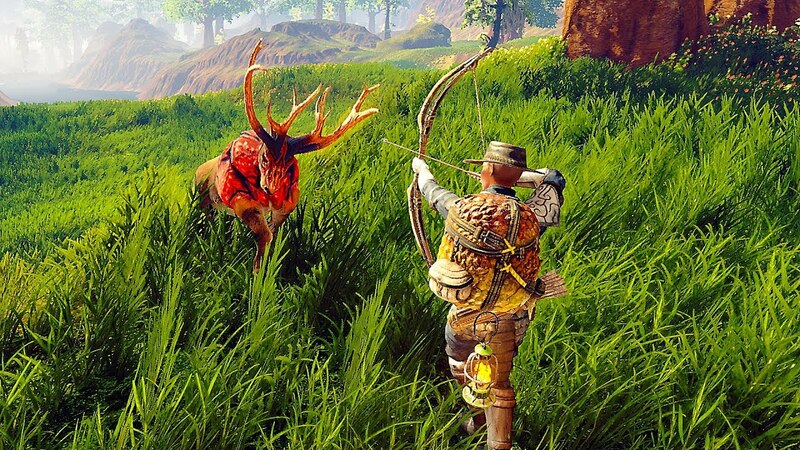 Some intriguing survival mechanics ensure that Outward will not be a game for everyone; however, those that push through will find an engaging, yet clunky epic. When Outward begins, you’re forced to pay your dues within five days—lest you face a foreclosure on your home. Of course, I failed at that. But that’s when the true adventure begins. You’re given the opportunity to join a number of factions, each promising to rid you of your debt in some way. Each faction requires you to travel across the world, which means you best prepare for a long journey. There’s no fast travel here; if a quest takes you to the other end of the country, you better hoof it. But you must be careful. Everything outside of the towns (and even sometimes within) is a threat. You’ll get tired from adventuring too much. You’ll get thirsty after mistakenly drinking some salt water. There’s no such thing as a “breezy” journey here, as every venture outside of a town’s walls can unleash the worst on you. Attacks from animals can result in infections, and staying out in the cold for too long can lead to illness. Outward always makes sure you feel vulnerable in some way. That’s without mentioning the limited inventory, too (there’s an encumbrance system, and it’s as bad as you’d expect). Outward is marketed as a “survival RPG,” and that’s no fluff. Keeping track of your vitals is just as important as keeping stock of your armory. You better make sure your backpack is filled with adequate supplies, unless you plan on risking your health. 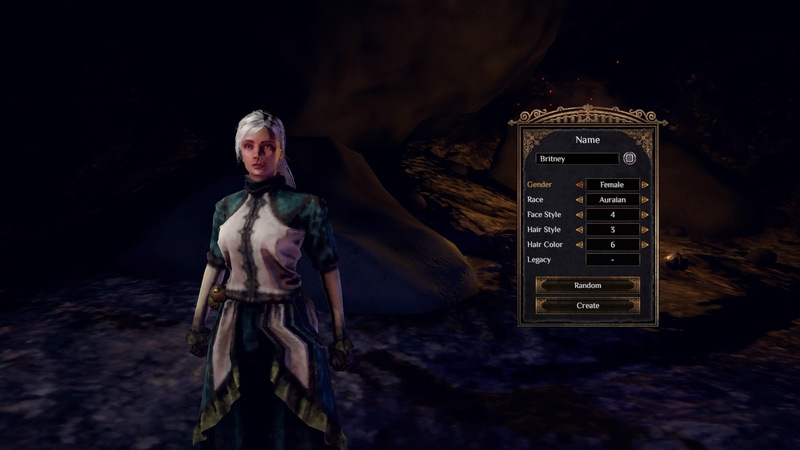 Some may see Outward’s mechanics as micromanaging (as did I, at first), but you eventually learn to realize that this is just part of being an adventurer, an average adventurer at that. Sure, there’s nothing more annoying than getting hungry while in the middle of a quest, but that’s that’s the risk you sign up for. From bandits to hyenas, the outside world is a dangerous one. Though you can fight back, that may not necessarily always be the best course of action. Combat is fairly clunky, so much that I often chose to avoid it except when necessary, or I felt confident enough that I’d take my opponent down. Yes, weapons do wear down, but that never became an issue during my time playing Outward. However, because combat is so clunky, you’re more often than not going to want to set up traps. You can get ahold of traps fairly easy throughout your journey, and they can be rigged with various accompaniments, with varying effectiveness. Unlike many action-RPGs, you’re often better off setting traps and meticulously planning your assault, as opposed to going in, swords swinging. It does tie into the general theme of Outward: you’re essentially a nobody in this fantasy world. While you do become stronger, and gain access to better equipment, you’ll never feel too powerful. Even casting spells can become a cumbersome affair. Magic can be more powerful than any weapon you have, but even gaining access to it is a journey in itself. I eventually fell into a pattern of setting up a tripwire trap (preferably with iron spikes, though wood will suffice), coming up to the enemy, and leading them into the trap. Now that they’re wounded, it’s time to do your worst. The outside world is so dangerous that enemies can even attack you while you’re resting to regain health (how rude of them!). Yes, this world is unforgiving, but if you prepare accordingly, and accept that you’re going to fail here and there, you can push through. You may have noticed that I’ve referenced failure a lot in this review. In Outward, you quite literally live with your failures. While you can save manually (and I recommended you do so often), it also autosaves with regularity. So often, in fact, that you never get any sort of do-overs. You only ever get one save file for each character you make. That means there’s no such thing as reloading a file to right a wrong. You need to learn to accept your choices, as you only get one shot. Do you regret which faction you ended up siding with? Was buying that weapon maybe the wrong call? Unfortunately, there’s nothing you can do about it. Outward truly wants to have you live (and die) with your decisions. And that’s to say nothing about failing in combat. Notice how I don’t say “die,” because you don’t truly die in Outward. Combat is not Outward’s strong suit. If you lose against an opponent, a few things can happen. You can be miraculously saved by a benevolent stranger, struggle your way back to town, or, in the worst case scenario, end up in the lair of whoever finished you off. For example, if you’re caught by bandits, you’ll be trapped in their camp, sans your equipment. You’ll be forced to fight your way out, and hopefully reclaim your supplies along the way. While the lack of true death may be seen as a cop-out by some, for me, it reinforced the weight of my failure. The world didn’t reset after I fell, it just kept on going, and I had to keep on going along with it. Such is life, I suppose. Outward will be a tough sell for many players. The clunky mechanics, dated visuals, and reliance on survival will likely turn off plenty of potential adventurers. However, you’ll soon learn to look past all of these hurdles. The less-than-beautiful graphics are wiped away the first time you see a glowing sunset. The sweeping orchestral score is possibly the best part about Outward, a truly appropriate accompaniment for this adventure. In another twist, there’s a co-op feature in which you can team up with a fellow adventurer. While I didn’t get to dabble it as much as I’d like, it does promise to be a significantly different experience. Journeying with a friend, rather than by yourself, can be a make-or-break prospect. If you’re scared of of the harrowing journey of Outward, you could always bring a friend to tag along with. It could be the difference between life or death. Outward review code provided by publisher. Version 1.01 reviewed on a standard PlayStation 4. For more information on scoring, please see our Review Policy.